In the final days of the Iranian year 1397, the state-run media published reports on gender gap in the job market in Iran, unequal wages of women and men, women’s unemployment, etc. This report contradicts previous reporting by the official IRNA news agency on January 17, 2019, in which it declared women’s participation in the job market as standing at 16.8%. Citing official statistics, Salamatnews.com also writes that Iranian women’s share of the job market is lower than the average 20% in Middle East and North African countries, adding that women’s unemployment is twice as much as the unemployment of men. The report also indicates that presently, one of every three women with a master’s degree is unemployed. So, Iranian women’s participation rate in the job market is much lower than other countries with average or relatively high revenues. Another issue of importance mentioned in this report, is the admission that women’s wages are far below those of men and indeed, one of the reasons for the recruitment of women is their cheap labor. Salamatnews.com, citing an example in one of the southwestern provinces, reveals that some women are paid salaries between 250,000 and 700,000 tomans (approx. $18.5-$52) while the minimum wage is 1.1 million tomans (approx. $81.5). In fear of losing their jobs and being fired, many women do not ask for pay raise or insurance, nor do they file any lawsuit against their employer. In another example, women teachers are forced to accept jobs with a monthly salary of only 500,000 tomans (approx. $37) without any insurance. According to the World Economic Forum, women’s participation in Iran’s job market is 23 percent while their wages are 41 percent less than those of men. Taking into account the purchasing power (PPP), this figure drops to 17%. Based on the same report, women comprise 46% of the professional and specialized workforce. It’s important to note that such stats don’t represent the reality because they rely on figures published by the Iranian regime, which is notoriously renowned for skewing stats to misrepresent the abysmal conditions of the country. It should be noted that the statistics published by the World Economic Forum is based on the Iranian regime’s official sources and statistics which are not transparent or accurate. 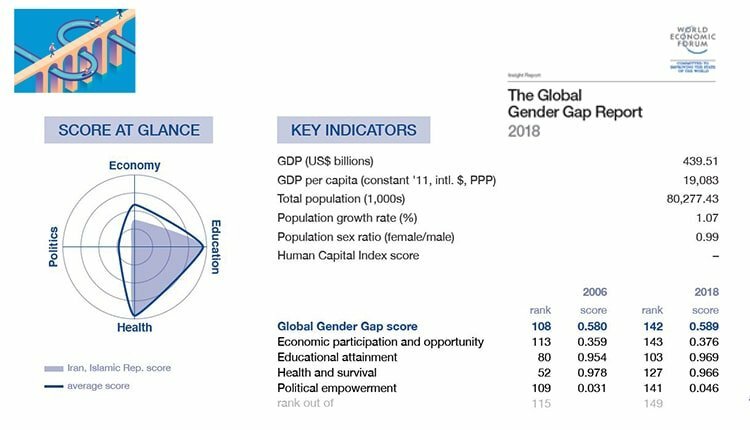 Nonetheless, the Iranian regime has been ranked 142 among 149 countries in the WEF’s Global Gender Gap Report 2018. Only seven other countries are ranked lower than the Iranian regime: Mali, Congo, Chad, Iraq, Syria, Pakistan, and Yemen.